Chloramine-T is a chemical used to prevent and/or protect gill diseases in fish. In many fish species, bacterial diseases that occur in the gills are controlled by chloramine-T application. However, the wrong application of chloramine-T causes oxidative stress in aquatic organisms. In this study, it is aimed to investigate the oxidative stress level of chloramine-T applied to rainbow trout (Oncorhynchus mykiss) in gills and to investigate whether this stress affects neuronal activity in brain. For this purpose, rainbow trout were used sub-lethal dose (2.8 mg / L) 0-1-24-48-72 and 96 hours of chloramine-T. The levels of mRNA transcripts of genes encoding antioxidant enzymes (superoxide dismutase 1 (SOD1), superoxide dismutase 2 (SOD2), catalase (CAT), glutathione peroxidase 1 (GPX1), glutathione peroxidase 4 (GPX4)) were measured by qRT-PCR. Finally, expression levels of c-Fos and BDNF genes were determined by qRT-PCR to measure neuronal activity in brain tissues. It was observed that the expression levels of SOD1, SOD2, CAT and GPX1 genes increased significantly in the gills of fish treated with chloramine-T. However, there was no significant increase in GPX4 gene. When the brain tissues of the same fish were examined, it was determined that c-fos and BDNF expressions increased in comparison to the control group. The results of the study show that excessive and/or incorrect chloramine-T application causes oxidative stress in the gill tissues of rainbow trout and negative effects of neuronal activity on brain tissues of fish exposed to oxidative stress. Kloramin-T, balıklarda solungaç hastalıklarını önlemek ve/veya bu hastalıklardan korunmak için kullanılan bir kimyasaldır. Birçok balık türünde solungaçlarda oluşan bakteriyel hastalıklar kloramin-T uygulanarak kontrol altına alınmaktadır. Ancak yanlış kloramin-T uygulaması sucul canlılarda oksidatif strese neden olmaktadır. Bu çalışmada, gökkuşağı alabalıklarına (Oncorhynchus mykiss) uygulanan kloramin-T’nin solungaçlarda oluşturacağı oksidatif stres düzeyinin araştırılması ve bu stresin beyindeki nöronal aktiviteyi etkileyip etkilemediğinin araştırılması amaçlanmaktadır. Bu amaç için gökkuşağı alabalıklarına sub-lethal dozda (2.8 mg/L) 0-1-24-48-72 ve 96 saat kloramin-T uygulaması yapıldı. Daha sonra antioksidant enzimleri kodlayan genlerin ( süperoksit dismütaz 1 (SOD1), süperoksit dismütaz 2 (SOD2), katalaz (CAT), glutathion peroksidaz 1 (GPX1), glutathion peroksidaz 4 (GPX4)) mRNA transkript seviyeleri qRT-PCR ile ölçüldü. Son olarak beyin dokularında nöronal aktiviteyi ölçmek amacıyla c-Fos ve BDNF genlerine ait ekspresyon seviyeleri yine qRT-PCR ile belirlendi. Kloramin-T uygulanan balıkların solungaçlarında SOD1, SOD2, CAT ve GPX1 genlerinin ekspresyon seviyelerinin kontrol grubuna göre önemli derecede arttığı gözlemlendi. Ancak GPX4 geninde önemli bir artış gözlemlenmedi. Aynı balıkların beyin dokuları incelendiğinde c-fos ve BDNF ekspresyonlarının benzer şekilde kontrol grubuna göre artış gösterdiği belirlendi. Çalışmadan elde edilen bu sonuçlar, aşırı ve/veya yanlış kloramin-T uygulamasının gökkuşağı alabalıklarının solungaç dokularında oksidatif strese neden olduğunu ve oksidatif strese maruz kalan balıkların beyin dokularında nöronal aktivitenin negatif yönde etkilendiğini göstermektedir. Kloramin-T, oksidatif stres, gökkuşağı alabalığı, c-Fos, BDNF. Booth, N.H., McDonald L.E. 1988. Veterinary Pharmacology and Therapeutics. 6th edn. pp. 774–777. Iowa State University Press, Ames. Boran, H., Altinok, I. 2014. Impacts of chloramine-T treatment on antioxidant enzyme activities and genotoxicity in rainbow trout, Oncorhynchus mykiss (Walbaum). Journal of Fish Diseases, (37): 431-441. Brooks, A.S., Bartos, J.M. 1984. Effects of free and combined chlorine and duration on rainbow trout, channel catfish and emerald shiners. Transactions of the American Fisheries Society, (113): 786-793. Bullock, G.L., Herman, R.L., Waggy, C. 1991. Hatchery efficacy trials with chloramine-T for control of bacterial gill disease. Journal Aquatic Animal Health, 3(1): 48-50. Carter, A.R., Berry, E.M., Segal, R.A. 2003. Regional expression of p75NTR contributes to neurotrophin regulation of cerebellar patterning. Molecular Cell Neuroscience, 22: 1-13. Chao, M.V. 2003. Neurotrophins and their receptors: a convergence point for many signalling pathways. National Review Neuroscience, (4): 299-309. Cosgaya, J.M., Chan, J.R., Shooter, E.M. 2002. The neurotrophin receptor p75NTR as a positive modulator of myelination. Science, (298): 1245-1248. Dönmez, M., Tatar, O. 2001. Fleto ve Bütün Olarak Dondurulmuş Gökkuşağı Alabalığının (Oncorhynchus mykiss W.) Muhafazası Süresince Yağ Asitleri Bileşimlerindeki Değişmelerin Araştırılması. E.Ü. Su Ürünleri Dergisi, 18(1-2): 125-134. Fang, Y.Z., Yang, S., Wu, G. 2002. Free radicals, antioxidants, and nutrition. Nutrition, 18(10): 872-879. Finkel, T., Holbrook, N.J. 2000. Oxidants, oxidative stress and the biology of ageing. Nature, 408(6809): 239-247. Fontagné-Dicharry, S., Larroquet, L., Dias, K., Cluzeaud, M., Heraud, C., Corlay, D. 2018. Effects of dietary oxidized fish oil supplementation on oxidative stress and antioxidant defense system in juvenile rainbow trout (Oncorhynchus mykiss). Fish Shellfish Immunology ,74: 43-51. Gao, Y.J., Ji, R.R. 2009. c-Fos and pERK, which is a better marker for neuronal activation and central sensitization after noxious stimulation and tissue injury?. Open Pain Journal, (2):11-17. Greenberg, M.E., Ziff, E.B., Greene, L.A. 1986. Stimulation of neuronal acetylcholine receptors induces rapid gene transcription. Science, (234): 80-83. Halliwell, B., 2006. Reactive species and antioxidants. Redox biology is a fundamental theme of aerobic life. Plant Physiology, 141(2): 312-22. Huang, E.J., Reichardt, L.F., 2001. Neurotrophins: roles in neuronal development and function. Annu Rev. Neuroscience, (24): 677-736. Johansen, I.B., Sørensen, C., Sandvik, G.K., Nilsson, G.E., Höglund, E., Bakken, M., Overli, O. 2012. Neural plasticity is affected by stress and heritable variation in stress coping style. Comparative Biochemical Physiology Part D Genomics Proteomics, 7(2): 161-71. Kujala, V.M., Reijula, K.E., Ruotsalainen, E.M., Heikkinen, K. 1995. Occupational asthma due to chloramine-T solution. Respiratory Medicine, 89(10): 693-695. Livak, K.J., Schmittgen, T.D., 2001. Analysis of relative gene expression data using real-time quantitative PCR and the 2(-Delta Delta C(T)) Method. Methods, 25(4): 402-8. Matsuoka, I., Fuyuki, K., Shoji, T., Kurihara, K. 1998. Identification of c-Fos related genes and their induction by neural activation in rainbow trout brain. Biochim Biophys Acta., 21; 1395(2): 220-7. Powell, M.D., Perry, S.F. 1996. Respiratory and acid‐base disturbances in rainbow trout (Oncorhynchus mykiss) blood during exposure to chloramine‐T, paratoluene sulphonamide and hypochlorite. Canadian Journal of Fish and Aquatic Science, (53): 701-708. Russell, A. 1998. Microbial Susceptibility and Resistance to Chemical and Physical Agents. In: Topley and Wilson’s Microbiology and Microbial Infections. John Wiley & Sons, Inc.
Stief, T.W. 2003. The physiology and pharmacology of singlet oxygen. Med Hypotheses, 60(4): 567-572. Thorburn, M. A., Moccia, R.D. 1993. 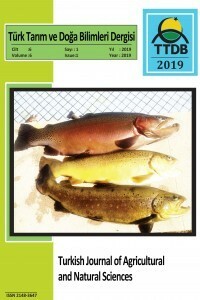 Use of Chemotherapeutics on Trout Farms in Ontario Journal of Aquatic Animal Health, 5(2): 85-91. Tongul, B., Kavakcıoğlu, B., Tarhan, L. 2018. Chloramine T induced oxidative stress and the response of antioxidant system in Phanerochaete chrysosporium. Folia Microbiol (Praha), 63(3): 325-333. TÜİK, 2018. (http://www.tuik.gov.tr), (Erişim tarihi: 05.11.2018).